The declining birthrate and a tendency to marry later or remain unmarried: These trends are prompting local governments to offer meeting places for single men and women so that they can meet prospective marriage partners. There used to be local busy-bodies to help young people get married, but in these days, such familiar ties as local communities or relatives can be so rarely found that young people have fewer opportunities to find the right person. Local communities, therefore, have come up with a variety of konkatsu (spouse-hunting) events that take the place of the old match-makers to help single persons to meet a good partner. 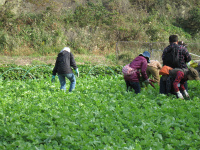 Agriculture centering on outdoor-grown vegetables has been active in Miura City in Kanagawa Prefecture, but the city is in need of people who will support its agriculture in the next and the following generations. Working together with the Miura City Agricultural Cooperative, the city carried out a questionnaire survey of its members concerning help in finding marriage partners. Of the 804 farming households which earn more than 500,000 yen a month from farming, only 416 have next-generation successors; many of them are worried about who will take over. 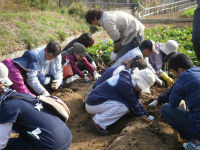 As many respondents answered affirmatively to spouse-hunting activities, Miura City came up with konkatsu events to raise awareness of the lack of future farmers. In this third year, a two-day and one-night konkatsu event involving farming experience was held in October, in which 20 young farmers in Miura City and 19 women who were interested in agriculture participated. They deepened their exchange through farming experience including harvesting crops. This event gave birth to some positive results: five couples were formed and one couple formed in 2010 married in November. Many participants commented favorably and the executive committee of the event feels it received positive response. This event will be continued next year and after. The third konkatsu event sponsored by the Yokohama Waterworks Bureau was held in September and October in Doshi Village in Yamanashi Prefecture, the water source of Yokohama City. Despite the restriction that participants should live or work in Yokohama, an increase of more than three times in applications came up to the capacity of 80. In 2009, Yokohama made a survey on its water supply system, which triggered this konkatsu event. The survey found that many of Yokohama citizens in their 30s were feeling, “Yokohama’s tap water is somehow not tasty.” The city therefore decided to put stronger emphasis on such people. Furthermore, not many of those in their 30s took part in the conventional water-resource bus tours. Yokohama, therefore, combined ecological activities and spouse-hunting to formulate this program in which even one person can easily participate and whose participants enjoy conversations within a limited time. On the days of the event, participants inspected the water source, studied the mechanism of the watershed protection forest, worked in pairs on such ecologically-friendly activities as underbrush cutting and planting, as well as lunch-making in groups and strolling in twos, thus getting to know one another better. There were some results; the city heard after the event that participants were keeping in touch with each other. Urayasu City, Chiba Prefecture, which has Tokyo Disneyland in it, has come up with a plan to conduct a konkatsu event in a hotel in Disney Resort in late November (sponsor: Urayasu Tourism Convention Association). When the city solicited via the city’s website participants for this event named, “Konkatsu in Urayasu --- Rehabilitation of Kizuna Bonding,” applications rushed in not only from the Tokyo Metropolitan area but also from the Kansai region. On the day, men and women will take lectures on konkatsu separately, after which they will watch a Bridal Fair for inspiration, and then attend a party to talk with each other. Applicants include many women: the thought of finding the right person in a Disney Resort hotel setting may have given them the idea that the romantic atmosphere may help people get together. The declining birth rate could reduce the young population, lower the dynamism of a local economy and lead to a financial stalemate of the local government. It deserves attention whether these local government attempts will bear fruit as planned so that men and women who meet via these local government konkatsu will get married.